Another order from Ernst & Young, but from different person. "As spoken earlier today, we would like to have a caricature to be done in theme with colour for 5 pax. The 5 pax will be the 4 members of Beatles and our partner. Attached is the photo of our partner and beatles. The above photos were chosen so that the people inside will look around the same age. 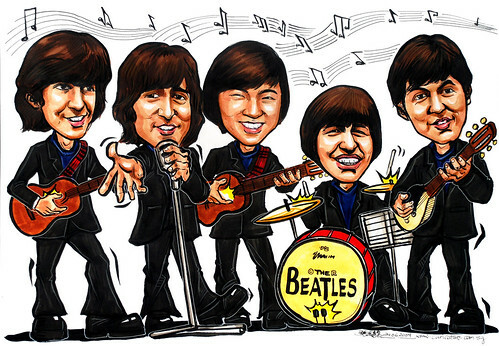 The idea is to have our partner playing band happily together with the 4 members of Beatles. Our partner should be the one playing guitar. The instruments for the rest of the beatles members will be up to u to decide. In appreciation of his dedicated service to EY Tax-B"
Though I have listened to some of their songs, this is the first time I take a close look at Beatles members, because of this job. Luckily the subject has a similiar hairstyle to the Beatles. 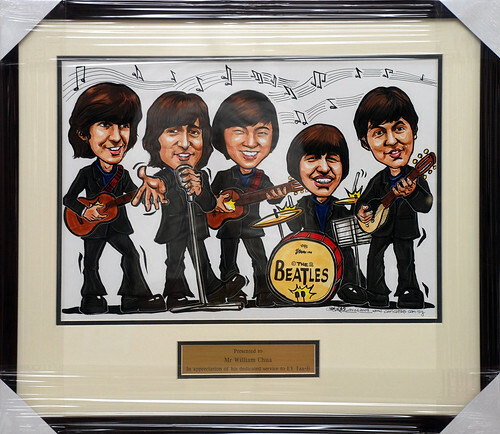 Though drawing celebrities and group caricatures have some stress, the main stress comes from the guitars and drums. Frankly speaking, I never like to draw them. It is a painful process to me.